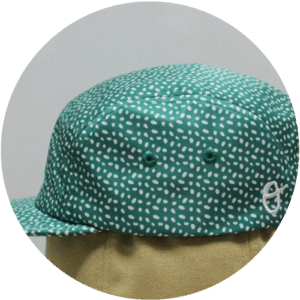 Our cap of the day is a kids size 5 panels camp from the Kids only brand Crusoé. Made entirely of laminated polyester, including the strap closure featuring a silver slide buckle. What makes this hat truly unique is it’s all over print; this kind of embellishment is very popular these days. The all over two colors print is sublimated on premium microfiber polyester. This shape is perfect for kids, it’s very light and flexible which makes it the perfect allies for outdoor activities. 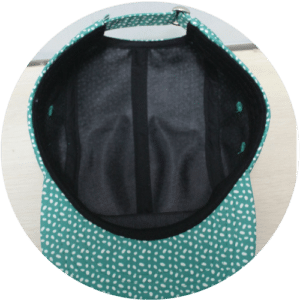 Following Crusoé’s request we use thick flexible foam inside the visor instead of the classic plastic insert to give even more flexibility and durability to the hat. 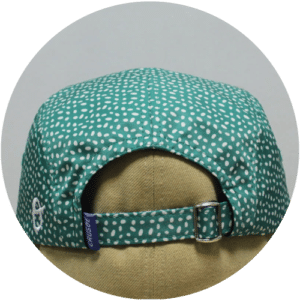 A small flat embroidery was placed at the back close to the opening and a beautiful woven label can be found inside the hat on the sweatband. After more than a year of drawing, breaking caps apart, prototyping and testing, the very first collection, entitled VAL ANDRÉ, saw the light of day in spring 2017. 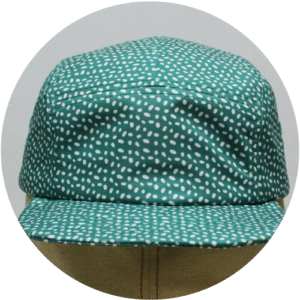 Quality 5-panel caps, well designed, that grown ups could wear (if they had tinier heads) but specifically made for young humans between 1 and 4 years old. Behind Crusoé also lies the ambition of reintroducing children in the wild. Growing up in cities, they progressively move away from their natural habitat, incidentally losing their animal instinct. By offering them a protection from the sun, we also want to allow them to spend more time outdoor, living an adventurous life while reconnecting with nature, instead of sitting on a couch or in a classroom. Yes, we definitely recommend a healthy dose of “school skipping”. That’s why the Crusoé caps are easily foldable, and can fit in the pockets of any raincoats or hiking bags.